All photos in this post are taken with my new Casio ZR-1000! Dropped by the Raffles City Love & Co with Yutaki for a private viewing of their diamond rings! 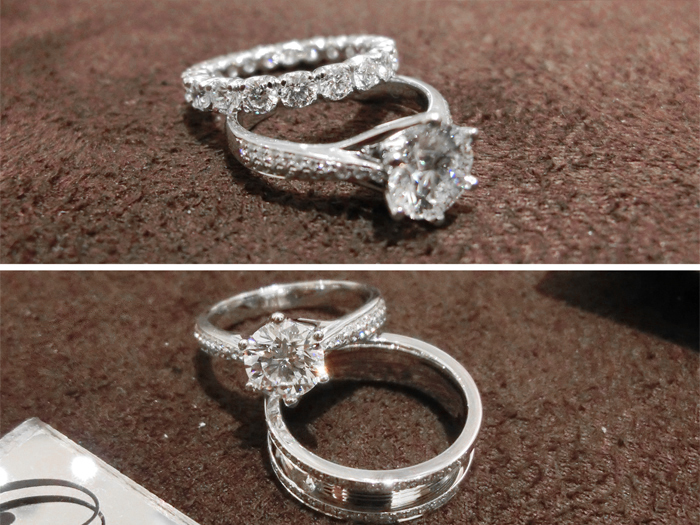 I never took much interest in diamond rings till this year, primarily because of Qiuting's surprise proposal & thus all the discussions about ring size/carat/cuts/designs! If you weren't already aware, both Xiaxue & Qiuting opted for a heart-shaped diamond ring, which is a bit rarer than normal solitaires but are increasingly popular because it's so pretty! The one at the top of the post is one of the heart-shaped diamonds currently featured at Love & Co! Hehehe got to try on their diamond rings without feeling really thick-skinned that I'm obviously not buying any :X Hahahaha. And I know generally proposals are somewhat supposed to be a surprise, but I would want to pick my own ring too :X I think it's really personal & important so it should be picked yourself! Tried on a simpler heart-shaped ring, without the curved band & small diamonds. I prefer this design! Back when all the discussion about rings started I already kinda decided I would opt for a basic solitaire though! I prefer the more conventional class designs so I looked at those instead. I like this! Super sparkly & eye-catching but still a classic design. Tried on another piece which features an interest diamond ring around the base! Never gave much thought (hey I'm only 22, marriage is still far away for me haha) to wedding bands &... anniversary bands! Increasingly couples also get anniversary bands to commemorate their years together, and the circular rings on the bands signify continuity & timelessness. "Hallo, may I help you? Want to buy ring for your girlfriend?" LOLOL Yutaki by one of their counters! And look! Super cute bear set that comes with the engagement rings! The bear can be made to kneel & hold the ring! 5 comments on "Love & Co."
The simple heart-shaped one is so pretty and cute. It's my favorite among the rings you showed us! And the bears are a major plus. Diamond rings are best option for showing love and I am full surprise by seeing this wonderful ring which completely built with diamond. I really like that heart shape diamond ring!! Hi do you know the price range of this heart shaped diamond ring?